When I was in high school, I used to wear silver glitter as eye shadow. And not just to pep rallies or out dancing. Oh, it’s a Tuesday? I have a geometry test today? Guess I’ll wear some silver glitter. 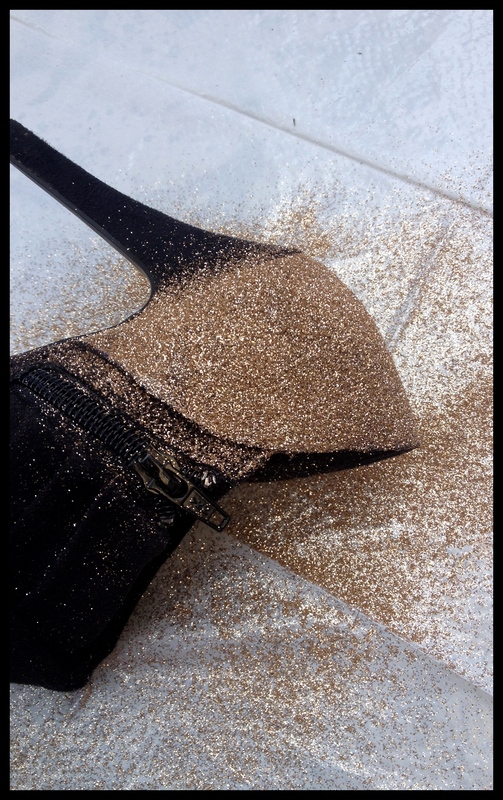 My glitter-crush is still alive and kicking ten years later. Although I can’t imagine an appropriate event for the eye shadow anymore. Halloween, maybe? New Years? Anyway. 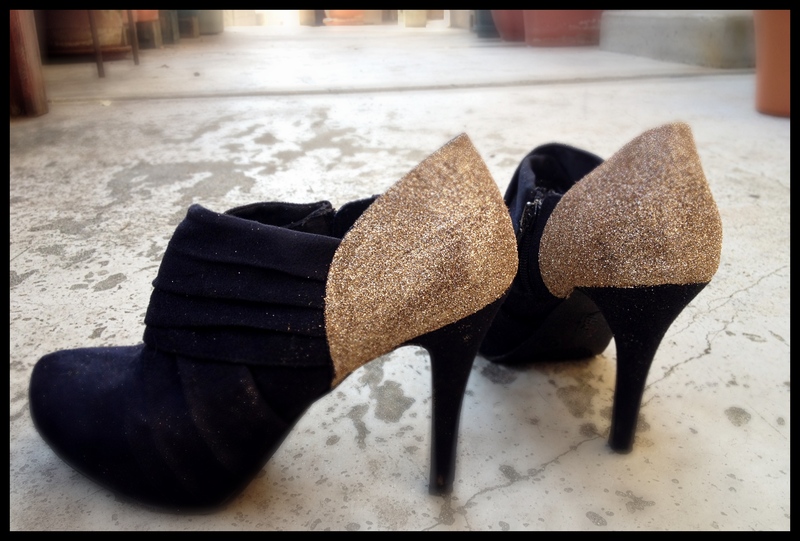 I saw these kicks on “this is glamourous” recently and it started a full on glitter revival. I searched and found crafts where people glittered double sided tape, camera straps, disco balls, utensils, wallpaper, even an edible glitter TRIFLE!! Now you can COOK WITH GLITTER!!! I went out that night and bought fabric glue and a big container of gold fine glitter. Not edible. But so sparkly. I admit, it took me weeks to decide what to glitter. It is a commitment, you know. I wanted so badly to glitter some shoes like the ones I’d seen, but I didn’t want to spend a lot of money on shoes I could potentially be destroying. Then I wanted to glitter my guitar. Brad was surprisingly into it. I got commitment-phobia. Every time I’d play I’d be covered in glitter. Or it’d be all scratchy. No bueno. 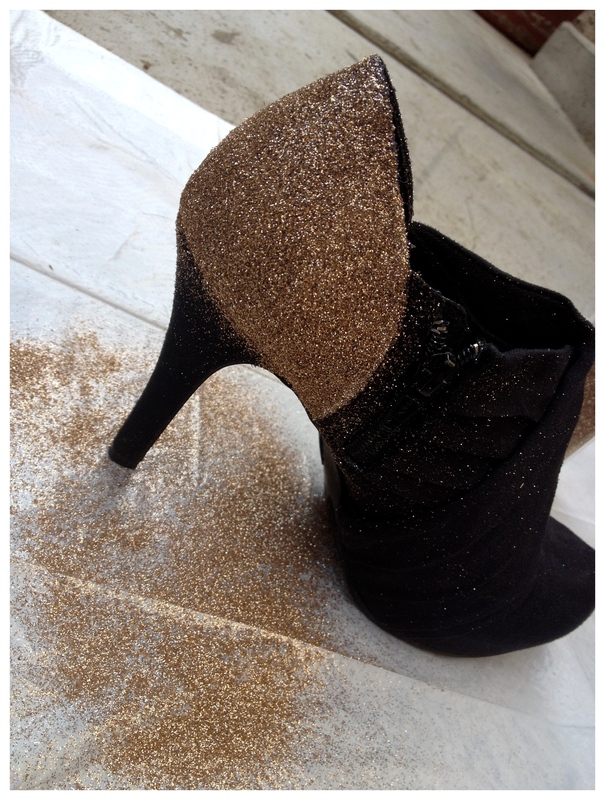 Then I started just picking random things that I thought would be fun to glitter. How about just a guitar strap? Or the ribbon on my favorite fedora? Or a clutch? Or Gibson? Brad said I could not glitter Gibson. Finally this week I took the plunge. My friend Deva had a short film premier at Universal and I needed something to wear. 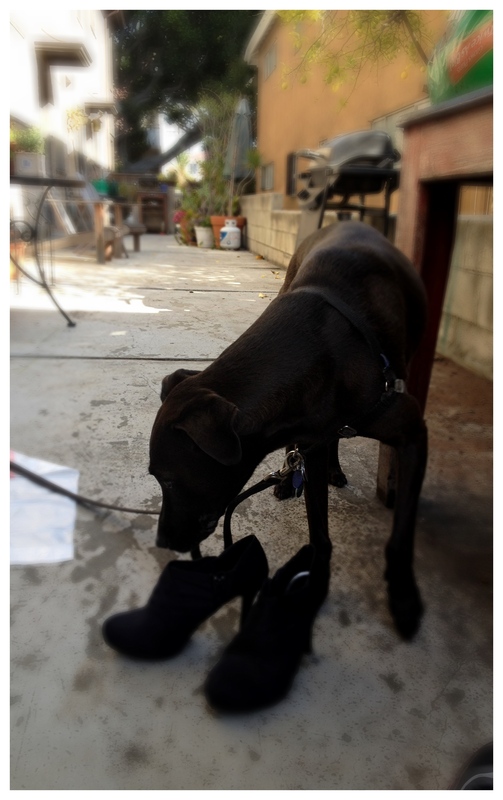 I pulled out a pair of black booties that I got at Target months ago. I hadn’t worn them once. 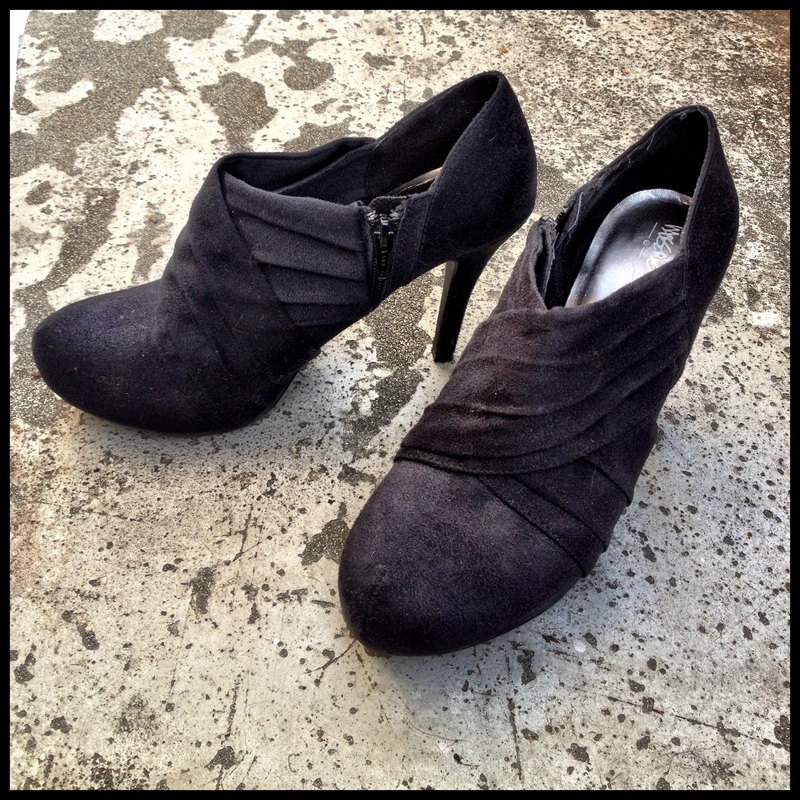 Something about the color and the platform part – they made my ankles look funny. And if I hadn’t worn them yet in the four or five months I had them, I was never going to wear them. Decision made. 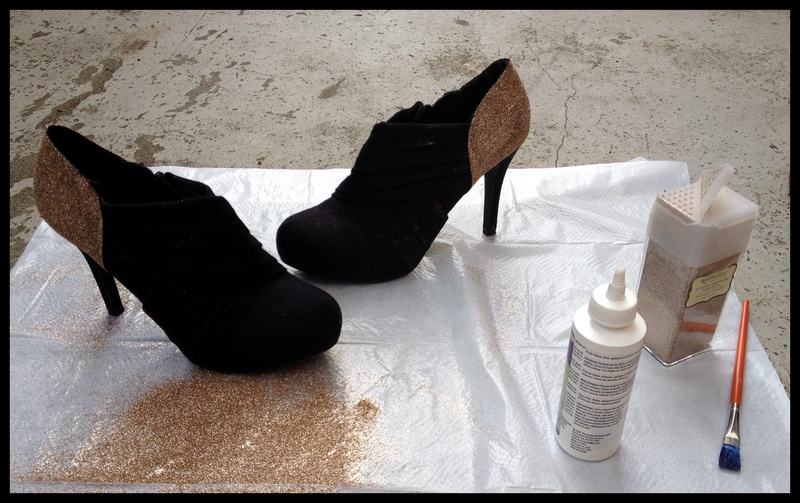 These booties were getting glittered. And I promised Brad that I wouldn’t glitter Gibson, but I think she was kind of into it. I laid down a trash bag for easy clean up. 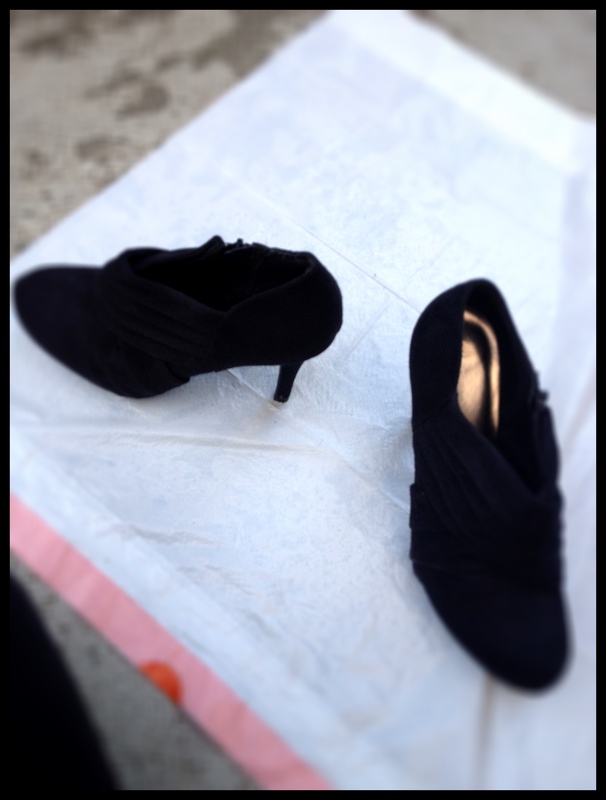 I painted on fabric glue to the piece of fabric that covered the heel of the shoes. As I waited, I again started searching for things to glitter. I was hooked. 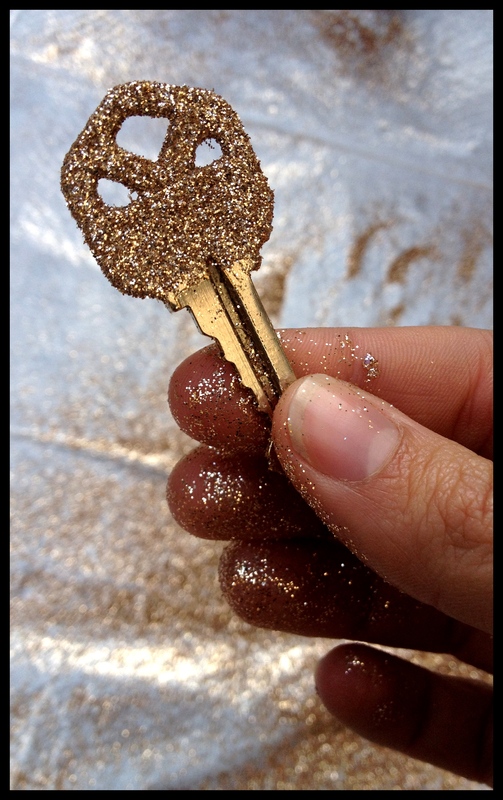 Now the key to my parent’s house in Maryland is glittered. I figure I don’t use it too much, but when I do it is always a special occasion. And if home is where the heart is, home should definitely have sparkle. 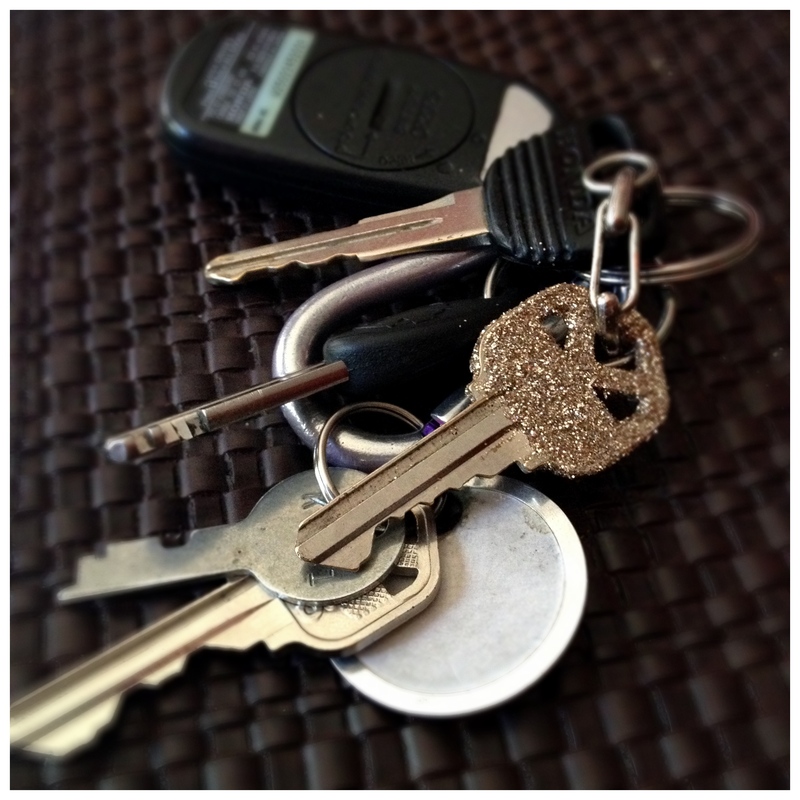 Now the rest of my keys look really lame. But the shoes. The shoes were a hit. They looked incredible and dressed up an otherwise pretty plain outfit. I think the silver-glitter eye shadowed Kels of 2002 would be pretty proud of where her glitter skills were going to go. And I’m still considering glittering the dog, FYI. Thank you. I too also LOVE Glitter. glitter eyeshadow was SO hot in 2002! i used to rock it all the time too.